Spoken by multiple drug violator (that leads to no punishments or convictions) who has maimed hundreds of racehorses over the years including killing them (deliberate or otherwise). I’m speaking as a former owner who sent horses to this killer. The drugs pumped into my horses should have thrown this racehorse abuser in jail. I pulled all of my horses and I got out of this vile business that is nothing but a horror show for the horses. Don’t be fooled by his smile – he’s a delusional sociopath. He’s also an addicted compulsive gambler who uses the horses for bets. His wife Jill is his willing accomplice. Shut down horse racing in California. I will be the first in line to sign the petition to garner the required 600,000 signatures. Everybody, I mean everybody in California needs to get together and shut this business down. THIS HELL ON EARTH – THIS UNBEARABLE, HORRENDOUS CRUELTY MUST STOP!!!!! SHUT DOWN THIS DEPRAVEDLY UNCONSCIONABLE, CRUEL, IMMORAL INDUSTRY. Love everything you are doing for the horses, thank you so much, from the bottom of my heart! Follow the money trail and the dead horses trail. See where they meet up. These are the people who have gotten rich while horses suffer catastrophic breakdowns. These are the people who pump them full of drugs and send them out. These are the people who don’t care about the horses or the jockeys. This has to stop. I have my own horses and they are the most magical creatures. No horse should have to endure this for human pleasure! I was totally shocked today when I happened to come across an article in The Baltimore Sun that published a letter I wrote to the editor. Then, a journalist from the L.A. Times, Steven Davidson of New Windsor, responded to my article disagreeing with everything I stated. Sure he has a right to speak out just as I do, but his story misses entire gaps of facts. He doesn’t mention the maiming, dumping, doping, and dying as if it doesn’t exist. Well, I would invite Steven Davidson of New Windsor, journalist for L.A. Times to come to the kill auctions for a few nights, there he will find the “disposables” of the horse racing industry. Better still, I would invite Steven Davidson to give a donation to all of the racehorses that people like Joy Aten Mary Johnson, Rose, and the plethora of OTTB rescues that are crying for donations because this business gives little to nothing to aftercare in relation to their multi-billion dollar profits. He bases his entire opinion by going to just ONE place “The Northview Stallion Station,” that he bases his opinion on exclaiming the virtues of how royal these horses are kept – it’s absolute egregious for a journalist to state things while omitting the major facts of this industry. There are so many stallions that ended up in the slaughterhouse like Ferdinand, Excelsior etc after they were treated like “royalty” when they generated money in the breeding shed. He forgot to mention horses like Battle Of Midway who had a reduced fertility, not enough to pay for himself, so after making MILLIONS he was put back into training only to drop dead in the dirt from multiple bone fractions. Still waiting for a full investigation into this one – but no mention of these poor horses. I’m appalled, and I didn’t realize that my comment would be used in this paper. Nevertheless, just as I have every right to free speech so does he, but a huge hole in his story is missing. Nobody in the horse racing business likes losers, and their losers are quickly disposed of then, of course, the extensive Death Lists – all of this missing from Steven’s article. Wonder who his friends are? I thank you so very much for exposing this business of greed, money, ego and drugs. I worked on the Southern California tracks as a stable employee for 2 well known trainers and all I can say is its about time! 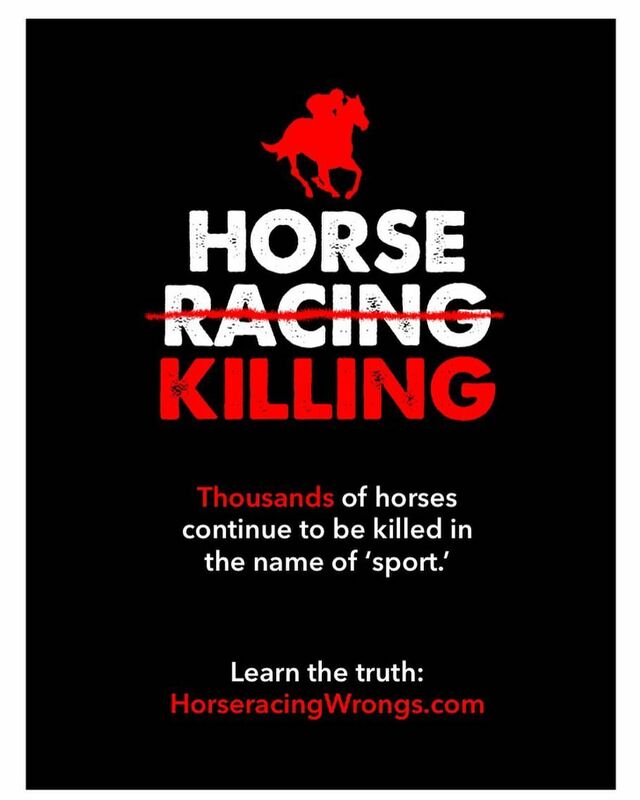 Horse racing should be banned! It should have been banned long ago! Exploiting animals for entertainment is morally wrong!